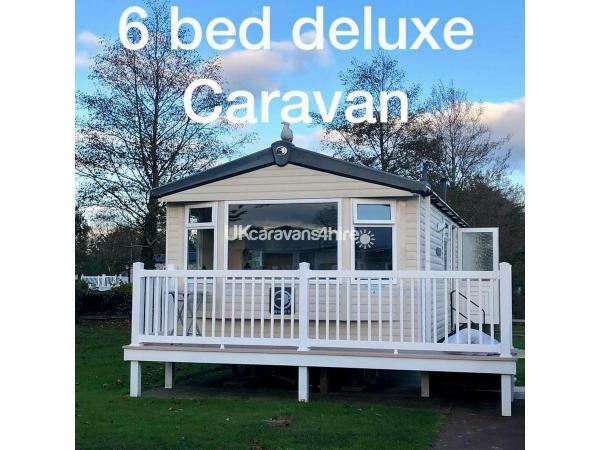 Our caravan is a 6 berth deluxe model. It has a private parking space for one vehicle. It also features double glazing and heating throughout. There is a large open plan lounge with an L shape sofa. This pulls out into a double bed. There is a gas fire and a new 32 inch TV with freeview. There is also a large corner dining area. The kitchen is fully equipped with gas oven and grill, extractor hood, fridge small freezer compartment, microwave, kettle toaster. Washing detergents and cloths and hand soaps are provided. 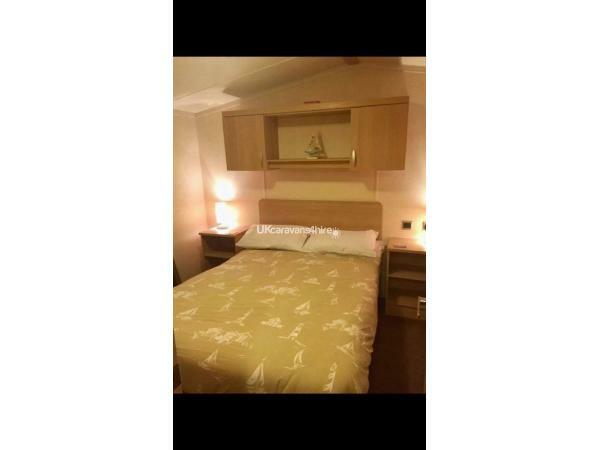 The master bedroom is large light and airy with a full length window, double wardrobe, bedside tables and lamps, vanity unit mirror, hairdryer and T.V. The twin bedroom has a wardrobe, side table and overhead storage. The family bathroom has toilet, wash hand basin, storage unit mirror electric shaving socket, large double shower and electric radiator. Externally there is a paved patio area with wooden bench and table. To the front is a newly fitted balcony with table and chairs, ideal to relax and watch the world go by. Behind the caravan is a large grassed area where children can play safely. Included: travel cot, highchair, iron, ironing board, hoover, hair dryer, hand soaps and detergent, pillows and quilts, complimentary tea, coffee and sugar. Gas and electricity is also included. Not included: Fun passes (these can be purchased at reception). Bedding, can be hired if needed. *New balcony and garden furniture. 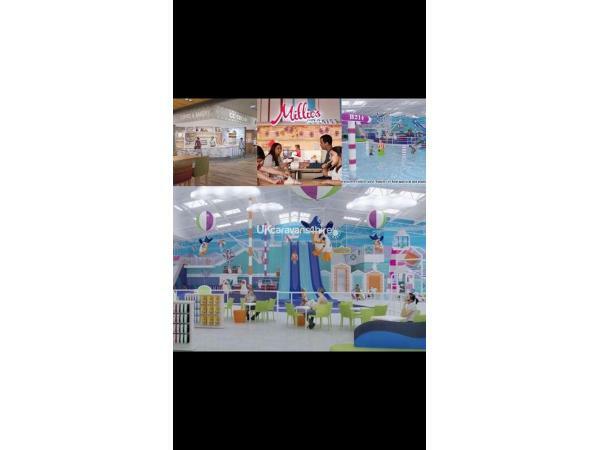 Activities: refurbished pool and splash zone, arial adventure, climbing wall (new for 2018) sports drome, swimming lessons, bike and boat hire, archery, rifle shooting, roller disco, segway safari, football and basket ball courts, go karts, arcade, shows, crazy gold, fishing lake, private beach access, soft play, outdoor play area and rock garden. Eating Out: Mash and barrel restaurant, fish and chip shop, Burger King, Papa Johns, Starbucks, Millies cookies and two supermarkets. Check in is 2pm and check out is 10.30am. Keys are in Keysafe and code is sent before arrival. £50 refundable safety bond is also required. 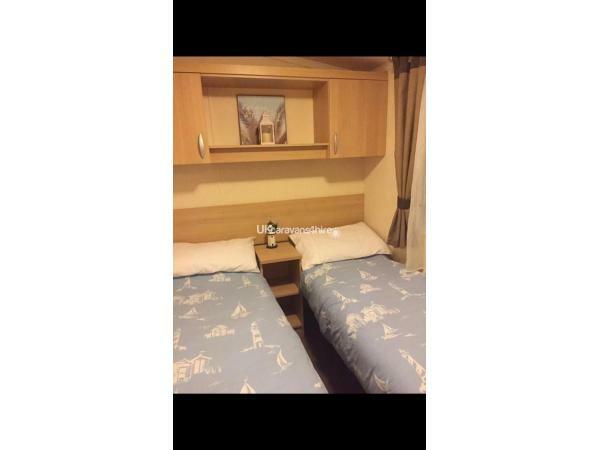 This is refunded once caravan is left as found. contact me on 07800723444 or message through web page.